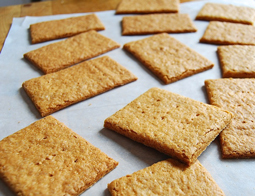 Giusto's Graham Crackers - A recipe from Savor California, the online showcase for extraordinary gourmet foods and beverages from California. In a medium bowl, whisk together the flours, cinnamon, baking soda, and salt. In the bowl of an electric mixer fitted with the paddle attachment, beat together the butter, granulated sugar, and brown sugar on medium speed until the mixture is light yellow and fluffy, about 3 minutes. With the mixer on low speed, add a third of the flour mixture and 1/4 cup of water. Mix for 30 seconds. Repeat this step once, then add the remaining flour mixture and mix just to combine. Turn the dough out onto a lightly floured surface and knead by hand for about 10 seconds. Divide the dough in half. Cover one half with plastic wrap and set it aside. Place a sheet of parchment paper on a work surface, put the dough on the parchment, and top with a second sheet of parchment. Roll the dough out to about 1/8-inch thickness. Repeat with the second half of the dough. Chill the dough for about 30 minutes. Remove the dough from the refrigerator, peel off both sheets of parchment, and put the dough on a cutting board. Using a square cookie cutter, cut out the dough, rerolling the scraps twice. Put the cookies on a parchment paper-lined baking sheet. Sprinkle each cookie with a pinch of turbinado sugar, if desired. Bake, rotating the sheet halfway through, for 20 minutes, or until the cookies are a dark golden color around the edges. Let cool for 10 minutes, then transfer to a wire rack to cool completely.